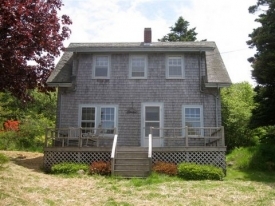 Quaint Monhegan Summer Cottage Rental! Fair Hill Cottage is conveniently situated in a prime location with trail access, village shops, and restaurants just steps away. 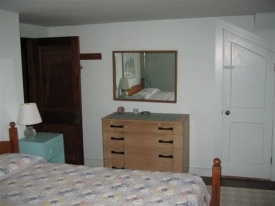 The only house on Monhegan with direct access to both the lighthouse (and the Whitehead cliffs), and northern trailheads (to Cathedral Woods and Pebble Beach), it provides the ideal situation for a memorable stay. 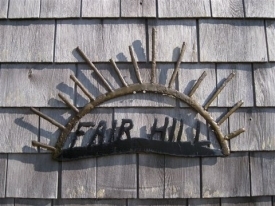 Fair Hill also sits adjacent to the ice pond and a 3 minute walk to Deadman’s Cove and some of the most breathtaking sunsets and views on the island. 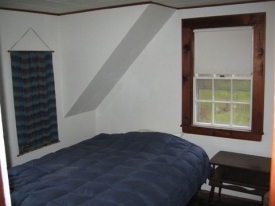 The cottage itself is a quaint and authentic Monhegan original. The cottage has 2 bedrooms with full size beds, as well as a sleeping sofa and cot. Both bedrooms feature ocean sunset views from the 2nd floor. The main floor features a charming eat-in kitchen with a gas stove/oven, refrigerator/freezer and a full array of cooking and dining necessities. Adjacent to the kitchen is a lovely breakfast room boasting natural light, an art table, and pleasant views. The living room is centered around a cozy fireplace with ample seating to curl up and read a book or relax after a long day of exploring. The outdoor area includes a spacious yard with a relaxing hammock and a front porch and back deck, both suitable for outdoor dining. Accommodates 4. House is equipped with DC electric lights, there is no AC current for plugging in appliances. Non-smoking.